First up, a very Merry Christmas to y'all! It was another #bakingtrio project time and this time, we've not only baked some stuffed cookies, but also enlarged the mini yule logs (recipe HERE) we've baked last year following cupcakejemma's recipe. I will, very much, advise you to at least HALF the buttercream recipe, or use a much smaller baking tray to get thicker sponge cake. If not you'll end up like us, chocolate-rum buttercream overload. Not that we're complaining though. That buttercream is out-of-the-world delicious. So now, on to the stuffed cookies! Note: I do suggest trying out with standard oreos instead as we found oreo thins a little too underwhelming. And also, because #bakingtrio prefers to do less sweet, you may want to add a little more sugar if you'll prefer your cookies to be sweeter. Or you might just want to use a sweeter variation of chocolate chips if you fancy. First up, cream your butter and sugars until it turns light and creamy, before beating in the egg and vanilla extract. 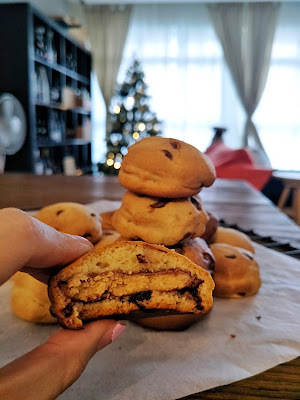 Sift in all your dry ingredients and fold until you do not see large pockets of flour, before folding in your chocolate chips until just combined. Make sure your dough is pliable and doesn't stick to your hands excessively (or even too liquidy to work with). Fold in more flour (tbsp by tbsp) if required, until you get a consistency you can work with. 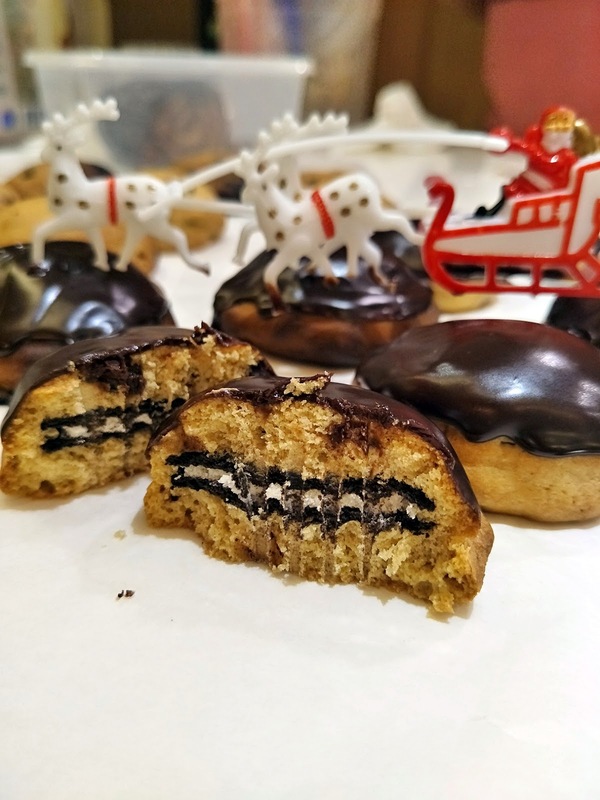 Then, use a tablespoon and spoon your cookie dough into 30g dough balls and wrap either an oreo cookie or reese peanut butter cup into each ball. This cookie will be slightly cakey and dense, so it wouldn't spread much so do remember to give your dough balls a little press on top to flatten it as you place them about 1.5 inches apart on your baking sheet, before baking them for about 11 to 12 minutes at 175 degree Celsius or until your cookies starts to turn a light golden brown at the edges. And I have to say the reese peanut buttercup ones were really satisfying! 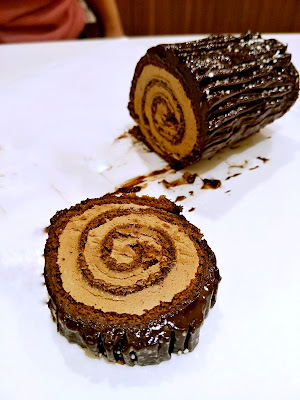 We decided to use the leftover ganache from the yule log for the oreo stuffed ones too, which kine of make it up for their lack of oomph. 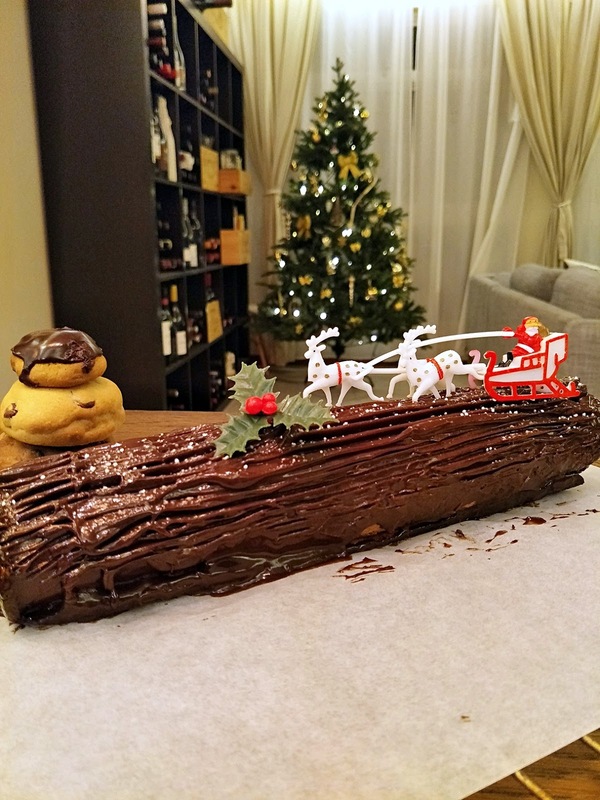 So, how was your Christmas bakes? Do share them with me!